Image #7 is one of my favourites for a couple of reasons… 1) It’s hard to beat blue, yellow and white when it comes to colour contrasts and 2) This image marked a return in my shooting style. Wth the MP-E new to me this season, I had been concentrating on shooting full frame close-up images and honing in on the perceived “main” subject. This shot of a small tephritidae resting on a flower re-aquainted me with a more environmental type approach to macro photography. 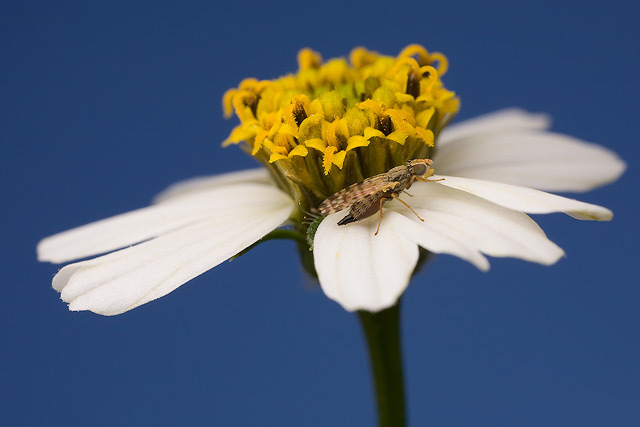 Tephritidae are more commonly known as fruit flies and at only a few millimeters in length are quite easy to miss when out shooting. While it is very difficult to identify individual species, I’d guess this may be either Campiglossa clathrata or Tephritis araneosa. Unfortunatly, despite there innocent looks, fruit flies are a major pest to the fruit growing industry and one of the main causes of “exclusion zones” set up around the country. While this particular species poses little threat, the more abundant Queensland fruit fly will lay its eggs in maturing or ripe fruit and all but destroy it from the inside out. 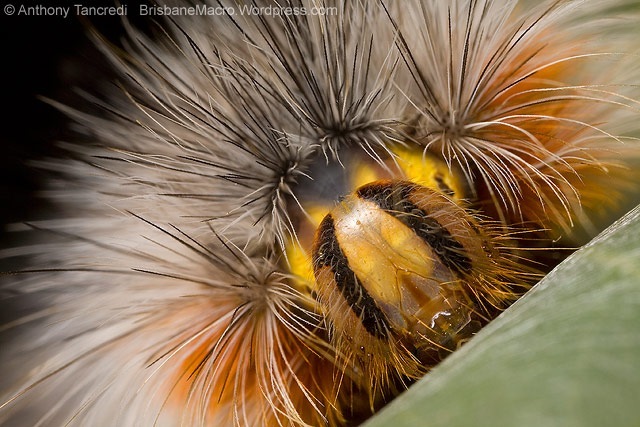 At #8 is a Hairy Mary caterpillar that I watched grow up from a small larvae of about 20mm in length, right through to it’s full size of about 90mm over a period of 4 or 5 weeks. When you see the same creature so many times, you cant help but form some sort of attachment to it! This was actually the last shot I took of this fantastic caterpillar before it disappeared, presumably (i hope!) into the cover of the surrounding long grass to cocoon. I’m often reminded when looking back at shots of this caterpillar of a highland cow with all that crazy hair and the ability to chew through a bucket load of greenery! It also gives it something akin to a personality, making it an even more memorable subject. I don’t get to shoot many bees so I felt very privileged when I came across the subject in the #9 position! This was only the second species of solitary bee I had ever shot and the first time I had encountered a neon cuckoo bee. While it may look peaceful and relaxed, I would actually rate this as the toughest shot I took all season. I was actually heading back to the car when I caught a glimpse of blue flash past to my left. I swung around in time to spot this bee and begin following it as it buzzed around the area. For the next 15 minutes I followed and watched as it landed only a few times, each for no longer than about 2 seconds. During this time at least 4 robber flies tried a mid air attack, but each time the bee swerved out of the way and kept moving. Eventually, and I suspect out of sheer exhaustion, it was forced to perch. From the time it landed to the time if took off again was only about 20 seconds, during which time I managed to get down to ground level and close enough to fire off two shots. One was out of focus and half out of frame and this was the other one. 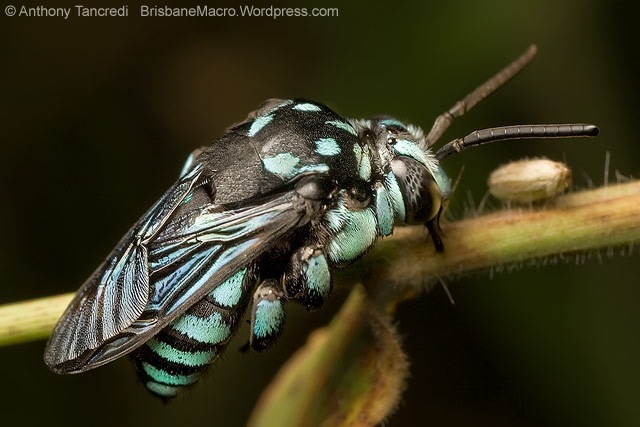 Thyreus nitidulus is known as a cuckoo bee due to the fact that it does not make it’s own nest, instead depositing it’s eggs in the nest of a blue banded bee where the larvae will hatch and feed on food collected by the host. This is without a doubt one of the best looking species of bees I’ve encountered. While this was the only sighting of the season, I’ll be on the lookout come spring to try and track down more of these little beauties! The #10 spot goes to a fantastic looking male green jumping spider. While I quite like the pose and lighting on this guys face, this one makes the list as it was the first time I had shot what is now one of my favourite jumping spider species. I managed technically better shots of them throughout the season, but the excitement generated when first running across a great looking new species will mean I always feel a connection to this image. 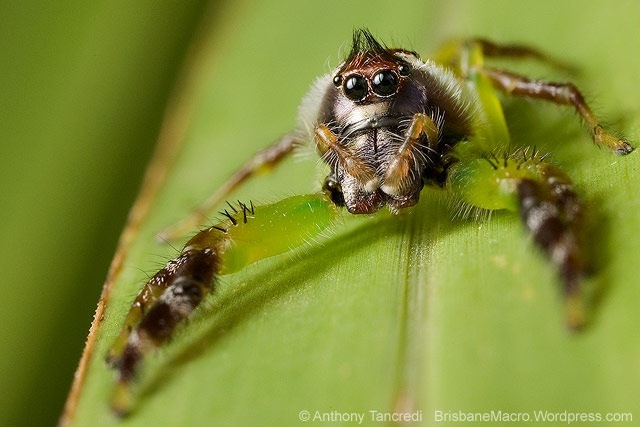 The green jumping spider (Mopsus mormon) is the largest species of jumping spider found in Australia, reaching a length of almost 20mm. Despite their size and the exaggerated fangs, the bite from this species while apparently being a little painful, is essentially nontoxic to humans. Like all species of jumping spiders, Mopsus mormon is a very efficient hunter. If you ever find yourself in a position to watch one of these or any other jumping spider species hunt, sit back and be amazed as they silently size up their prey before jumping from quite a distance with absolute precision and grabbing the target with the front two legs before inject venom with the fangs. Without a doubt, jumping spiders are one of my favourite subjects to photograph. I love the facial expressions and hair-do’s these guys have going on. There’s something about the wide head and big eyes of the male green jumper that almost reminds me of a baboon from some angles. Truly amazing little creatures. Well, the macro season has pretty much shut down over winter…. there’s still the odd thing to shoot, but generally speaking, things are pretty quiet. But, at least spring is only 5 weeks away! Given the lull, I thought I’d go back through the images I’ve taken this season and try and pick my 10 favourites… not an easy task when you’ve shot close to 7,500 macro shots since January! Looking at this top 10 now, I’m not sure if I’d class them as the best images from this season, and some aren’t even technically that strong, but I have somewhat of an emotional connection to each one that adds that extra dimension for me personally and that probably helps them get over the line. I’ll try and post one a day for the next 10 days (or so :)). I hope anyone viewing these images enjoys at least some of them, and at least partially as much as I enjoyed taking them! You are currently browsing the Best of category at Brisbane Macro.